ATHENS — Four men have been indicted on charges of murder, engaging in a pattern of corrupt activity and other charges in connection with a shooting that left one man dead on the city’s west side on Nov. 25. The men are accused of leading a drug operation that included trading stolen property for drugs and killing Charles Duncan, Sr., 55, of Logan during an attempt to collect a drug debt. Court documents show Michael Allen Russell, 18, was charged with murder, involuntary manslaughter, aggravated robbery, robbery, receiving stolen property and having weapons while under disability. Bernard C. Mitchell, 23, was also charged with murder, involuntary manslaughter, aggravated robbery, robbery and having weapons while under disability, along with engaging in a pattern of corrupt activity, breaking and entering, grand theft and burglary. Troy Vermillion, 28, was indicted on charges of murder, involuntary manslaughter, engaging in a pattern of corrupt activity, aggravated robbery, aggravated trafficking in drugs, robbery, burglary, receiving stolen property and having weapons while under disability. Robert Martin, 26, was charged with murder, involuntary manslaughter, engaging in a pattern of corrupt activity, aggravated robbery, robbery, two counts of receiving stolen property, burglary, aggravated trafficking in drugs and having weapons while under disability. 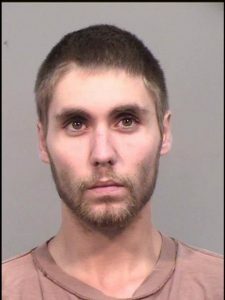 A fifth person named in the indictments, Jonathon Champe McLaughlin, pleaded guilty Tuesday to engaging in a pattern of corrupt activity, having weapons while under disability, aggravated trafficking in drugs and burglary. He was sentenced to 18 years in prison. Mitchell is accused of stealing more than $10,000 of property from his aunt and uncle, some of which he used “as a drug payment,” according to court documents. The indictments also state that McLaughlin broke into his parent’s house with Vermillion and Martin to steal firearms. McLaughlin was at the West Washington apartment with Duncan on Nov. 24, where court documents say McLaughlin “engaged in trafficking in aggravated drugs,” specifically ecstasy, with Duncan and his girlfriend. McLaughlin delivered more drugs, this time methamphetamine, to the couple on Nov. 25, but Duncan “failed to pay” McLaughlin. McLaughlin left the residence, but drove a vehicle owned by Vermillion back with Mitchell and Russell, demanding payment for the drugs. Mitchell attempted to kick down the door of the apartment. Arraignments have been scheduled in Athens County Common Pleas Court for December 12.